With the dizzying array of subscription commerce solutions available, choosing a provider to meet your specific needs isn’t easy. There is always a risk that you’ll get locked into a provider that doesn’t quite fit, which can quickly limit your ability to respond to future shifts in products/services, pricing or market opportunities. 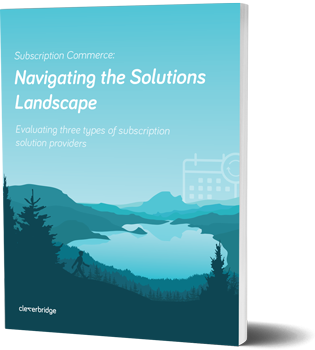 To help with the decision, grab our guide and discover the three types of subscription solutions. We break down the solutions into simple pro/con lists and provide specific use-cases. Find what fits for you. Download the guide now. "Commerce platforms not designed for the selling of digital goods are unable to cater to the evolving business models and specific features needed to sell digital goods and services online. eBusiness firms with the constraints of an ill-suited technology will lag behind customer needs, miss out on monetizing digital content, and neglect launching new product offerings."